By now you have all already seen Christopher Nolan's The Dark Knight. Maybe you've even seen it on Imax. So the question: Does The Dark Knight live up to the hype?? The Answer: Heath Ledger's performance is indeed spectacular. While I thought he was great in Brokeback Mountain, this last performance is in my mind his best. Oscar worthy? Definitely. The film on the other hand?? Sadly, I can not be so enthusiastic. The film is frantic and lacks structure. While individual scenes (mostly with Ledger) are thrilling and seeing the film on IMAX is breathtaking, the film as a whole felt rushed and not well thought out. I would like to credit Nolan with creating chaotic structure to mirror the themes of chaos in the film...but I don't think he really thought through it that far. That being said, I am willing to bet that this film is a moment of great importance in the history of cinema (not merely for its stellar box office performance). The film represents a sea change (well... an attempt at a sea change perhaps...more on that in a sec) in the superhero genre similar to the shift from the traditional western (think John Wayne in Ten Gallon Hat) to the revisionist western (think Clint Eastwood in a slightly less than Ten Gallon Hat). In Dark Knight, Nolan attempts to portray the Super hero as the Anti-Hero. Or perhaps the revisionist super hero? (spoilers ahead but I mean, you've seen it already right?) So how is this new Batman installment a change for the darker? First of all, Batman fails. The damsel in distress, played this time around by Maggie Gyllenhaal dies (rumors of her coming back to life as cat woman aside). Batman fails to save her and fails to prevent Harvey Dent from turning into Two-face. Secondly, the tone of the film and world that serves as a backdrop to the action is distinctly dark. Kudos to Hans Zimmer for creating an eerie often piercing score. Lastly, Batman becomes "the Dark Knight." By taking the blame for the murders that Harvey Dent committed, he becomes known as a cop killer and a villain. The film ends with now Commissioner Gordon leading his men to hunt Batman down. Not to mention the fact that Batman wiretaps all of Gotham in order to find the joker. And yet.... he didn't do it. Batman didn't kill those men. He destroys the citywide wiretap after the joker has been found. Frankly, I think Nolan chickened out a bit. In one scene, the Joker gives two boats full of passengers the detonation device to the other boat and says unless one boat blows up the other, both boats will be destroyed. Miraculously no one on either boat destroys the other to save themselves. Human beings turn out to be not so corruptible, cowardly and selfish after all (Maybe I am cynical but I found that scene particularly hard to believe). By stopping short going all the way into the darkness, Nolan fails at his attempt to single-handily change the genre within one film . (perhaps Zack Snyder's The Watchmen will go there). In Sam Peckinpah's notorious violent film The Wild Bunch (1969), the "heroes" are by no means so clean. They are not thieves with honor, they are cold blooded, bawdy and often downright despicable. They do not rise above the fray (they shoot the lovers that have jilted them, leave less intelligent gang members to die, get drunk and sleep with prostitutes. The world around them is equally harsh. Gone is the western of protecting the women and children, they are as trigger happy as the men. Throughout the film, cruelty and violence are met with laughter by the characters (definitely not he audience). As if this is the only way to accept life in this dog eat dog world. 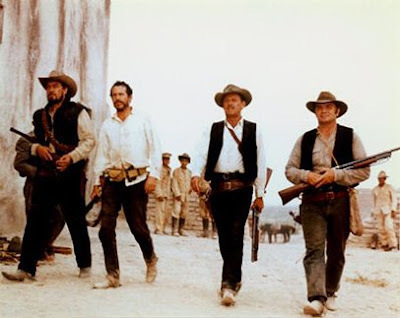 The Wild Bunch was among the films that signaled a change in the genre. The west that of J. Wayne was no longer squeaky clean. I think the visual darkness of The Dark Knight and the, albeit unsuccessful, attempts to "smear" the superhero signal a possible sea change in the super hero genre. From Wikipedia " The violence that was much criticized by critics in 1969 remains controversial. Director Peckinpah noted it was allegoric of the American war against Vietnam, whose violence was nightly televised to American homes at supper time. He tried showing the gun violence commonplace to the historic western frontier period, rebelling against sanitised, bloodless television westerns and films glamorizing gun fights and murder. The point of the film is to take this façade of movie violence and open it up, get people involved in it so that they are starting to go in the Hollywood television predictable reaction syndrome, and then twist it so that it's not fun anymore, just a wave of sickness in the gut . . . It's ugly, brutalizing, and bloody awful; it's not fun and games and cowboys and Indians. It's a terrible, ugly thing, and yet there's a certain response that you get from it, an excitement, because we're all violent people." I think we are ready to see our super heroes be flawed and "two-faced." Is this a reflection of the times in the real world? Our Iraq war versus Peckinpah's Vietnam? Perhaps. It remains to be seen whether super hero films in the next few years follow down this darker road.